Lara Croft’s origin story ends up being appropriate, just not the way the developers had envisioned. Lara Croft’s origin story is supposedly one of survival. The introduction shows an innocent female archaeologist and her friends heading for adventure and fame. Circumstances quickly deteriorate, and the first Lara does in the game is to set herself on fire, fall several meters down onto a metal pin, and brutally pull it out from her side. The sequence is emotional and well executed, the subtext being that this hurts Lara mentally as much as physically. Before the credits roll, the screen fades to white and the text a survivor is born appears in bold, rough letters. And it might have worked. She has undoubtedly become tougher and more experienced. But she has also become a cold‐​blooded, psychopathic killer. The part of the game leading up to her first kill is emotionally well executed. The game focuses on the trials and challenges a confused and scared girl has to overcome in order to survive in an unknown and dangerous environment. The way the game portrays and focuses on the mental trauma Lara experiences after her first self‐​defense kill also deserve some credit. But not long after, she kills vast numbers of people as a matter of course, seemingly without being affected by it at all. Later in the game, when the circumstances grow increasingly desperate, Lara even starts shouting back to her enemies – at first that she’ll never give up, and later something to the effect that none will escape her wrath. Enemies are brutally slaughtered in close quarters using everything from an axe to the neck or head, to veritable executions at point‐​blank range using pistols, shotguns and assault rifles. The killmoves are elaborate and brutally visual, and it’s hard not to view Lara Croft as a psychopathic machine of death. Maybe it’s realistic. For Lara, it’s definitely a question of kill or be killed, and she does what she has to in order to survive. Surely her trials and hardships would be sufficient to flip certain switches in anyone’s mind. Still, much of the game feels a bit off. It’s not often I experience ludonarrative dissonance – the extreme distance between the story or theme in a game and the actions you perform while playing – as distracting or detrimental to my experience. It’s a quite common phenomenon in modern games and needn’t be a significant problem. A game only has to follow its own logic. 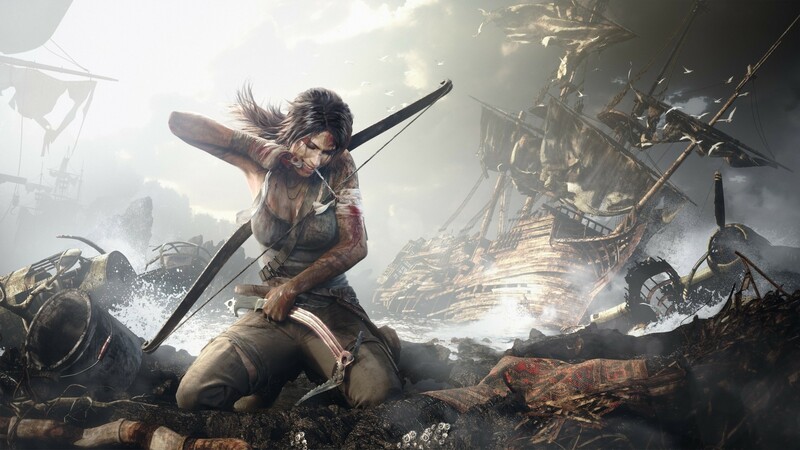 Tomb Raider starts off believable and emotional, but the immersion is soon lost to the severe gap between the theme of Lara’s story and her actions, and thus the emotional sting of the game all but disappears. Part of the reason the emotional appeal diminishes throughout the game is because it’s partly tied to her physical state. Everything constantly explodes around her, she’s thrown every which way, slips and falls down great heights, time and again. Apart from the player getting numbed by the scale and frequency of her ordeals, the game is inconsistent in their effects on Lara. Where some falls send her on a mandatory quest for first‐​aid kits, other equally upsetting events only has her clutch her side for a few steps. Thus the emotional effect is gone, and one is left feeling a bit cheated. Tomb Raider is generally an entertaining game, and does much right throughout. It’s promising from the get‐​go, and I’m only disappointed because it doesn’t follow up on that promise, instead crumbling to pieces under the weight of its own inconsistencies. The story is about loss, survival and growth. The game is about killing enemies on your way to the next incapacitating fall. The game puts the story front and center, but the mechanics provide little support for the story. In a way though, Crystal Dynamics did succeed. They wanted to tell how Lara Croft went from being an innocent and inexperienced girl to become the Lara Croft we know from the earlier games. I can but tip my hat and say job well done: No living being who stood between her and the next ruin could ever hope for more than a quick bullet to the head. Escapism is negatively charged. Let’s change that. Pingback: Say One Thing, do Another – How Ludonarrative Dissonance Destroys Stories | what's in a game?